ABOVE: Le Corbusier's Maison Blanche after restoration. La Maison Blanche, or "The White House," was the first independent project of Le Corbusier. The 25-year-old architect, who still went by his birth name of Charles-Edouard Jenneret, designed the house for his parents and lived there himself for several years. At the time of its construction in 1912, the house was a revolutionary design. The entire structure was supported by four 50 x 60-cm pillars, with lightweight internal partition walls that could be relocated at minimal expense if the occupants wanted a new layout. La Maison Blanche was interesting in other ways, too: It had an assysmetric design, with a unique façade on each side, ten types of windows, and a grey roof made of Eternit fiber-cement shingles instead of traditional tiles. La Maison Blanche represented a major break from the Art Nouveau style or Jugenstil architecture that was still popular in Europe at the turn of the 20th Century. 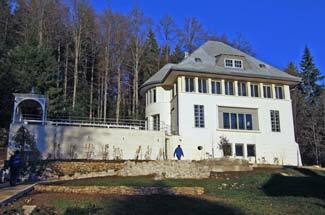 The Jeanneret family sold the villa in 1919, and it underwent many changes over the next 60 years. It was classified as an historic monument by the Canton of Neuchâtel in 1979, and exterior restoration finally began in 1994. The Association Maison Blanche was founded in 2000, and full-scale restoration work began in 2004. The restored house opened to the public on October 30, 2005. Opening hours: The house is open to the public on Friday, Saturday, and Sunday from 10 a.m. to 5 p.m. Groups can arrange visits outside of normal opening times. Allow 30 to 60 minutes to tour the house, and be sure to pick up a copy of the excellent La Maison Blanche Visitors' Guide. Admission: When we last checked at the end of 2013, the adult ticket price was CHF 10, with reductions for seniors, students, children, and the unemployed. For more information (including an "Access" map that shows bus routes and parking), see www.villa-blanche.ch. 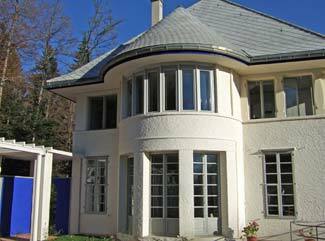 Tips: Several earlier villas by Le Corbusier and his collaborators are nearby at Chemin de Pouillerel #1 (built in 1906), #6 (1908), and #8 (1908). These are private homes, so don't enter their gardens or peer through the windows unless you want to practice your French with the local police. If you're a fan of the architect, look for an October, 2018 book titled Le Corbusier: The Built Work, by Richard Pare and Jean-Louis Cohen. The 480-page hardcover is billed as "the most thoroughgoing survey of nearly all of Le Corbusier's extant projects, beautifully photographed and authoritatively detailed." More photos of Le Corbusier's "White House"
Above: The garden façade of La Maison Blanche, showing the restored Eternit roof (which had been replaced by conventional roof tiles in 1940). Above: A cloth shade on a ceiling-light fixture, wallpaper based on a remnant found by the restoration team, and the dining room. 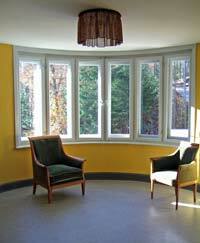 Above: Charles-Edouard Jeanneret's upstairs bedroom.